Louis Garneau launches the 7th edition of the Granfondo Garneau-Québecor presented by Cascades, that will be held on August 9, 2015. The formula remains the same: a 110-km bike ride between Trois-Rivières and St-Augustin-de-Desmaures. In addition, we will be honored to ride with Bernard Hinault, five-time champion of the Tour de France, who has agreed to be the Honorary President of the 2015 edition of the Granfondo. A draw for the bike used by Bernard Hinault during the event, a yellow Dura-Ace Garneau Gennix worth $7,000, will be held among the first 1,500 registered participants. Sign up now, online at www.quebecgranfondo.com or by phone at (418) 878-2130. 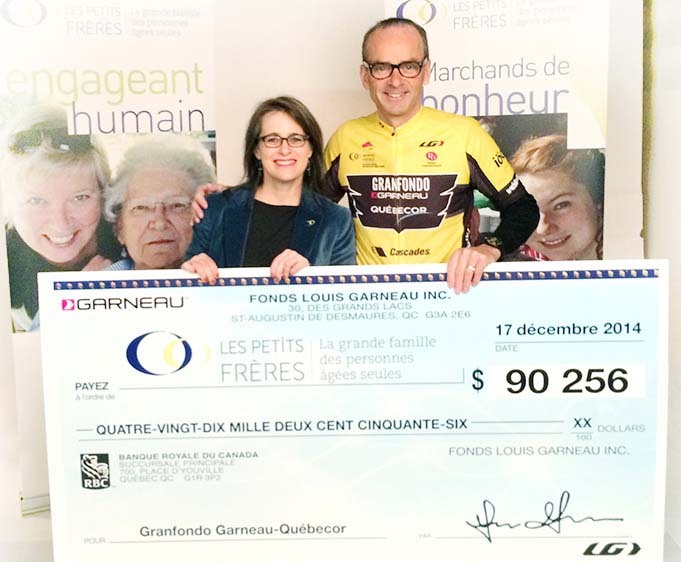 It is with great pride that Louis Garneau presents the Little Brothers organization with a cheque for $90,256, following the last edition of the Granfondo Garneau-Québecor which attracted nearly 3,000 cyclists. Since its creation in 2009, all the profits have been given to the Little Brothers and, to date, $290,000 have been raised for the organization. Louis Garneau wishes to thank all the partners and participants involved in making the event a success. For Louis Garneau, organizer of the event, the funds collected are synonymous with both victory and a promise kept: "We were able to raise these funds thanks to the 3,000 participants of the Granfondo and to the help of our valued sponsors. I wish to extend a special thank you to Marcel Bouchard, Honorary President of the 2014 edition, who successfully communicated the message of the Little Brothers' cause. I am proud that together, we contribute to improving the lives of the elderly suffering from isolation while practicing a sport we love." Caroline Sauriol, Director of the Little Brothers organization, explains that this amount will greatly improve the help to the elderly. "The money raised will be used for the maintenance of the holiday cottage at St-Joseph Lake and for the development of the Little Brothers of the greater Quebec City region. This will allow us to welcome more lonely elderly from Quebec City and the surrounding area who, thanks to the Little Brothers, will never be alone again," she declared. Bernard Hinault, an exceptional athlete who inspired a whole generation of cyclists, has agreed with great pleasure to take on the role of Honorary President for the 7th edition of the Granfondo Garneau-Québecor. Between 1978 and 1986, this French cyclist won the Tour de France five times, the Giro d'Italia three times, and the Vuelta a España twice. He was the last cyclist to equal the performances of the likes of Jacques Anquetil and Eddy Merckx at the Tour de France. Even though he is no longer a professional cyclist, Bernard Hinault's passion for the sport has never faltered. He has held several positions in the Tour de France organization as well as within the French national team.